In the video, the guy talks for the first 10 or 15 minutes, using a lot of marketing speak that doesn’t really clear anything up. But he eventually gets to the demos, and they are quite interesting, and worth the wait. The ribbon UI in SharePoint is pretty cool, especially after you kick yourself and remember that it is running in a browser! And there are lots of asynchronous improvements, so you don’t see the whole page flash and reload every time you click a button or select a list item. Also, I’m sure that more than a few readers of this blog will also find the in-box Silverlight web part interesting! 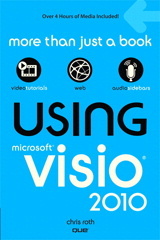 The Visio Services part appears at 18:30. 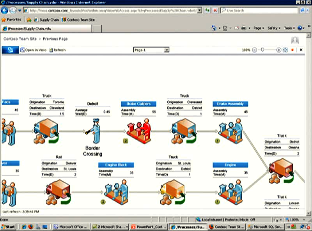 He then went into a demo in which a Visio process diagram is shown directly in the browser. The steps in the diagram are adorned with Data Graphics that show data in text and number callouts, but color-by-value is also used to highlight problems by coloring shapes. The data source is SQL Server, and changes to the data will reflect in the “Visio part”, even for users that don’t have Visio installed on their PCs. You can check out the video here: SharePoint 2010 Overview video. I also found a nice run-down of SharePoint 2010’s new features on the SharePoint Knowledge Base blog. Richard Harbridge, who author’s the site, equated the new Visio services to what Microsoft previously did with Excel and Excel services. 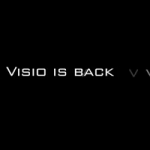 And Visio Insights mentioned Visio services back in February, 2008! Visio “vNext” introduces server-rendered, data-refreshable diagrams for the first time. Visio Services allows data connected diagrams to be published from Visio to a server and viewed by users directly in their web browser. There are no client bits to install. An API is also provided for creating mashups of diagrams and additional data. Allowing the data connections to remain live for “read-only” Visio diagrams opens up a whole new set of exciting possibilities. Visio becomes a much more capable dashboard and reporting interface. It will be exciting to see what people come up with! If you’re getting excited about the new Office 2010 release, the website: www.office2010themovie.com is promising to publish more preview videos “soon”. Previous Post: « Automatically Number & Connect Shapes – With Code! Hi Visio Guy, I have found a huge library of Visio stencils for SharePoint 2010 at http://sharepoint2010.visioshapes.net that your readers might like to know about. They are commercial but there are hundreds of them for both User Interface and Design. Worth a look I think!